Well ahead of the peak season crowds, March travelers have the run of Amsterdam's top attractions—as well as the spectacular Keukenhof bulb flower park, which opens in late March. While the weather can be hit-or-miss, it's a clear departure from the Dutch winter months, and the fickle bouts of the sun become more constant towards the end of the month. The winter chill in Amsterdam is replaced with milder weather, and most years attest to a fair share of sunny days later in the month. While temperatures do gradually warm up throughout the month, freezing temperatures—especially at night—are not uncommon early on in the month. March is the rainiest month in the springtime, with an average of 2.3 inches of precipitation spread across 10 days. Given that spring doesn't officially begin until the end of March, it also shouldn't be surprising that snow is a possibility even into March; you can expect light flurries or snow showers about three days out of the month during March. One perk of March: The days start growing longer. By the end of the month, the sun won't set until 8 p.m.
March is still susceptible to showers, and it can become quite cold especially after dusk, so keep an umbrella and jacket close at hand. You'll also want to pack waterproof boots, a windbreaker, and a hat. Gloves also come in handy, especially if you want to rent a bike to pedal along Amsterdam's iconic canals and bridges. In addition to the re-opening of Keukenhof, the Netherlands' famous gardens, March is full of art, dining, and sporting events. The semi-annual DiningCity Restaurant Week allows diners to experience lunch or dinner at some of the most exclusive restaurants in the Netherlands for a modest fixed price, with special "restaurant week menus"; some participants even boast Michelin stars. Started as a mere joke in 1995, the Gouden Kabouter ("Golden Gnome") Awards—the "Incredibly Unofficial Oscars for the Club Scene"—have taken off to become an annual event and spawn a Golden Gnome international edition, held in October to coincide with the Amsterdam Dance Event. The yearly HISWA Amsterdam Boat Show features state-of-the-art vessels, nautical accessories, and a week's worth of maritime-themed activities for water sports fans amid its themed pavilions. Keukenhof, the Netherlands' world-famous bulb flower park, re-opens for the season. At its peak, you can expect to see seven million bulbs in bloom. Travel there without a hitch with our Keukenhof transport tips. Roze Film Dagen (Pink Film Days) assembles feature films, documentaries and film shorts that testify to the diversity of the LGBTQ experience, with submissions from 32 countries worldwide. The route of the Silent Procession takes in the landmarks associated with the 1345 "Miracle of the Host," when an ill man vomited the sacramental bread (or "host"), which then refused to burn when thrown into the fire. The Amsterdam Coffee Festival takes place in early March at Westergasfabriek. Coffee fans and professionals flock to the festival, which features cuppings, barista demonstrations, food stalls, live art, and music performances, and more. 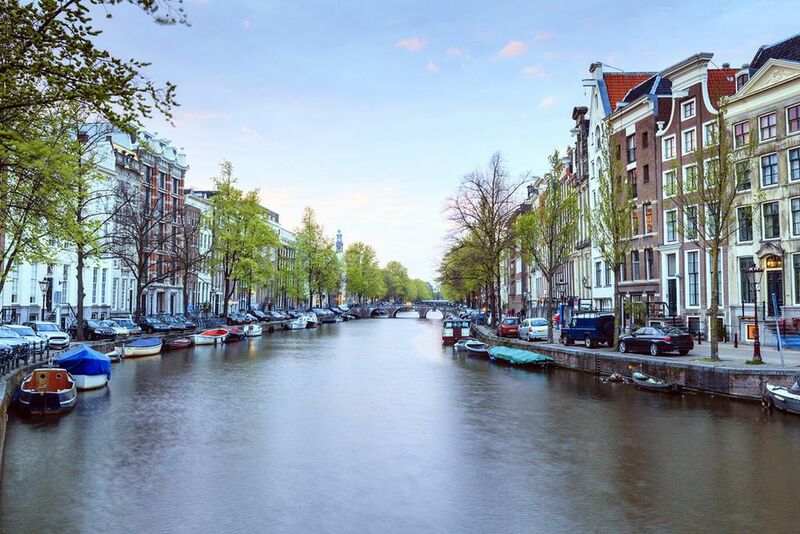 Airfare and accommodations in Amsterdam are still at their off-peak rates in March, so you can find more deals. Off-season also means fewer crowds to interfere with your exploration of the city. It's unlikely that you'll be fighting hordes of fellow tourists in museums and other major attractions. Beware that while some bulb flowers will be in bloom throughout March, the tulips sometimes hold off until April. For optimal blooms, plan your visit from late March through mid-April. March, with its cold, clear days, can be great for photography. Blue skies and the bare trees make a great backdrop for photos of Amsterdam's famous canal houses. On a cloudy day, use the grey skies to practice your black-and-white photography skills. Amsterdammers love getting outdoors when the temperatures start to warm up. Take advantage of a sunny day like a local and find a quaint café along a canal to post up at and watch the scenery go by.